Enfin nous entrâmes dans cet heureux pays d'Autriche. Tout y avait un autre aspect. L'abondance et le bien-être se manifestaient partout; et l'esprit éclairé de Joseph Second, commençait à se répandre sur les campagnes. Nous restâmes trois semaines à Vienne dont le séjour me plut tant, qu'il fallait tout le désir que j'avais de revoir les miens, pour me résoudre à m'en séparer. Je fis un voyage à Esterhazy en Hongrie; pour voir Joseph Haydn, qui y était établi auprès du prince de ce nom, grandpère de celui d'à présent. Ce prince vivait en grand seigneur, ayant une petite cour, un très bon spectacle, et réunissant autour de lui tout ce qu'une grande fortune peut procurer d'agréments et de plaisirs. Lorsqu’un étranger arrivait, on lui envoyait aussitôt un équipage pour voir les jardins et des billets pour le théâtre. Je m'y rendis le soir même, et j'y trouvai Haydn, que je reconnus à l'instant sur les nombreux portraits que j'avais vu de lui. Je l'abordai en lui disant qu’un amateur passionné de la musique et admirateur de ses compositions avait fait ce voyage pour faire sa connaissance personnelle. Il vint souper avec moi: le lendemain matin une voiture du prince nous attendait pour la promenade: je fus prendre Haydn qui me montra les détails du jardin; ensuite il vint diner avec moi et l'après diner je retournai à Vienne. Il me conta en abrégé son histoire, qui était accompagnée de détails tres curieux. Lorsque je lui fis connaitre tout ce que je pensais de ses compositions, et que je lui retraçai le juste enthousiasme qu'elles causaient partout, il me répondit: "Ah! Monsieur: nous avons à Vienne quelqu’un qui nous écrasera tous; c'est un génie universel, auprès duquel je ne suis qu’un enfant." Il parlait de Mozart. Celui-ci vivait encore à cette époque, mais je n'eus pas la satisfaction de le voir, car il était absent. Il rendait, à ce qu'on dit, le même respect à Haydn, qu'il regardait comme son maitre en composition. Finally we entered this happy country of Austria. Everything there looked different [from Salzburg]. Abundance and prosperity were manifest everywhere; and the enlightened spirit of Joseph II was beginning to spread across the country. We stayed in Vienna for three weeks, a stay that pleased me so much that I had no desire to see my family and bring myself to depart. I made a trip to Esterhazy in Hungary to see Joseph Haydn who had settled there with the prince of that name, the grandfather of the present one. This prince lived like a great lord, with a small court, a very good theater, surrounding himself with all attractions and pleasures that a great fortune can provide. When a foreigner arrived, he immediately sent a carriage to see the gardens and theater tickets. I went there the same evening and I found Haydn, whom I recognized instantly from the many portraits I had seen of him. I approached him and told him that a passionate lover of music and admirer of his compositions had traveled to make his personal acquaintance. He came to have dinner with me. The next morning a carriage of the prince was awaiting us for the excursion. I took Haydn who showed me the details of the garden; Then he came to dine with me and after dinner I returned to Vienna. He gave me a brief outline of his story which was accompanied by very curious details. When I told him what I thought of his compositions and described to him the real enthusiasm they caused everywhere, he replied: "Ah! Sir: we have someone in Vienna who will crush us all; he is a universal genius, compared to whom I am a child." He spoke of Mozart, who at that time was still alive, but I had not the satisfaction of seeing him, because he was absent. They say that he showed the same respect for Haydn whom he regarded as his teacher in composition. Je ne comptais m'arrêter à Vienne que huit ou dix jours, et j'étais sur le point d'en partir, quand je vis annoncé dans les affiches du théâtre, la reprise de l’opéra, "La Flute Magique". Le vif désir que j’avais d'entendu ce chef d'œuvre de Mozart, dont retentissait toute l’Europe; me retint une semaine de plus. Il fut, à ma grande satisfaction donné trois jours de suite. La disposition d'esprit où j'étais me fit doublement gouter les beautés de cet ouvrage. Il me mit dans un tel ravissement, que je souhaitais mourir au sortir du théâtre, afin de ne pas perdre une seule des impressions que j'éprouvais. Je me disais comme les napolitains lorsqu'ils parlent de leur capitale: "Vedi il flauto magico e poi mori". I had planned to stay in Vienna eight or ten days and I was about to leave, when I saw the restaging of the opera "The Magic Flute" announced on theater posters. The strong desire to hear this masterpiece of Mozart, which resounded throughout Europe, held me back for another week. To my great satisfaction it was given on three consecutive days. The state of mind I was in, made me doubly enjoy the beauties of this work. It put me into such delight that when I left the theater I wanted to die, so as not to lose a single one of the impressions I felt. 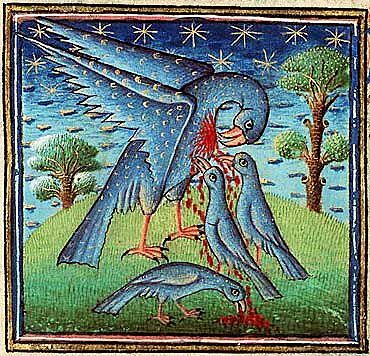 I said to myself like the Neapolitans do when they say about their city: "See The Magic Flute and then die". In the suburbs there are several smaller theatres: and at one of these it was where I heard Mozart's Sauberflöte, the sweetest music ever composed. The passages from Tepper de Ferguson's memoirs were first published in July 2011 by Olga Baird in her paper "Ludwig Wilhelm Tepper de Ferguson (1768-1838): Viennese years" at the 13th International Congress for Eighteenth Century Studies in Graz. The following post is based on a paper which in September 2002 I submitted to the conference "Music and Death in the Eighteenth Century" (King’s College London, 8–9 February 2003) and which was rejected by the organizer of this conference. That on 28 July 1741 the nine-year-old Joseph Haydn sang at Antonio Vivaldi's exequies at St. Stephen's Cathedral in Vienna is one of the most beloved myths of music historiography. Many authors seem to be deeply enamored with the image of two great artists, meeting unknown to each other and somehow "passing the torch" from one creative spirit to the other. And yet, this scenario is pure fiction. Caused by a series mistranslations and misunderstandings it became a popular myth and made its way into the biographies of both composers. I have developed a simple and quick litmus test for the quality of a new Haydn biography: look for Vivaldi's name in the index, go to the page where Vivaldi is referred to (usually near the beginning of the book) and check if young Haydn is described as "having sung at Vivaldi's funeral". And if this is the case the book can be put away immediately. Countless books about Haydn – especially some of those published on the occasion of the 2009 anniversary – did not pass this test, because many authors simply cannot let go of this beloved myth. The most recent item that caused my surprise at the longevity of this story, is Frank Huss's book Joseph Haydn. Das unterschätzte Genie, published in 2013, where on p. 17 the author states: "Likewise Haydn sang in the Requiem which was performed in the course of the funeral service of the composer Antonio Vivaldi (1678-1741), who had surprisingly died in Vienna." On p. 823 of the Haydn-Lexikon (Laaber-Verlag 2010) Christin Heitmann writes: "Haydn war zu dieser Zeit Chorknabe an St. Stephan – es ist daher zu vermuten, dass er im Chor bei der Beerdigung Vivaldis gesungen hat." The Vivaldi and the Haydn literature are equally flawed concerning this issue. Since every author copies from all the others, scholarship soon ends up in a kind of echo chamber and printed misinformation is spreading relentlessly. As I stated in a lecture on source studies that I gave in October 2005 at the University of Salzburg: "Going back to the original sources often leads to a systematic demolition of the secondary literature." To shed more light on the fascinating genesis of the Haydn-Vivaldi myth we have to go back several decades when the music world first learned where and when Abbate Vivaldi met his maker. L'Abbate Antonio Vivaldi eccelentissimo Sonatore di Violino detto il Prete Rosso, stimato compositore de concerti, guadagnò ai suoi giorni cinquantamille ducati, ma per sproporzionata prodigalità mori miserabile in Vienna. The Abbé Antonio Vivaldi, a most excellent violinist called the Red Priest, the famous composer of concertos, is said in his times to have earned fifty thousand ducats, but owing to excessive prodigality died a pauper in Vienna. The Hon. Mr. Antonius Vivaldi, secular priest, who died of internal inflammation at the age of 60, was seen by the coroner at the Saddler's House next to the Carinthian Gate and was buried in the graveyard of the civic hospital. Peal of the small bells .........." 2"36"
Bier renter and sexton .........." 1.15"
Most translations in the literature, like the one in the 1970 English edition of Kolneder's book (with the symptomatically wrong shelfmark "necrology, Vol. 23, fol. 63") and in Karl Heller's Antonio Vivaldi: The Red Priest of Venice (Portland: Amadeus Press 1997) are flawed: a Bahrleicher is not a gravedigger and a Kuttenbub is not a choirboy. It seems that David Marinelli, the translator of Heller's book, copied some of his mistakes directly from Kolneder. The "Wallerisches Haus" and the "Spitaller Gottsacker"
Vivaldi died on 28 July 1741 of internal inflammation at the house of Agatha Waller, née Freisinger (1674-1751). The spelling of her name as "Wahler" which appears in the literature is based on a mistranscription of the h-like sign before the l, which – as I have explained elsewhere on several occasions – was not an h, but a sign that doubled the following consonant. In 1714 the four-story building at the south end of the Kärntnerstraße was bought by the Prague-born saddler Augustin Waller (1678-1730). Waller was able to afford this purchase, because he was the personal master saddler of the widowed Empress Wilhelmine Amalia. Even in 1830 there was still a saddler's workshop located on the ground floor of the building. 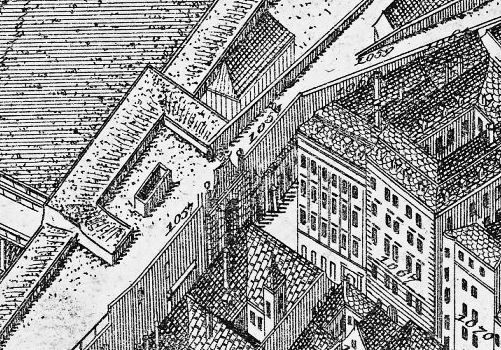 The "Wallerisches Haus" at the southwest corner of the Kärntnerstraße opposite the Kärntnertor in 1778. This clip from Huber's map shows that in the eighteenth century the building had only four storeys. 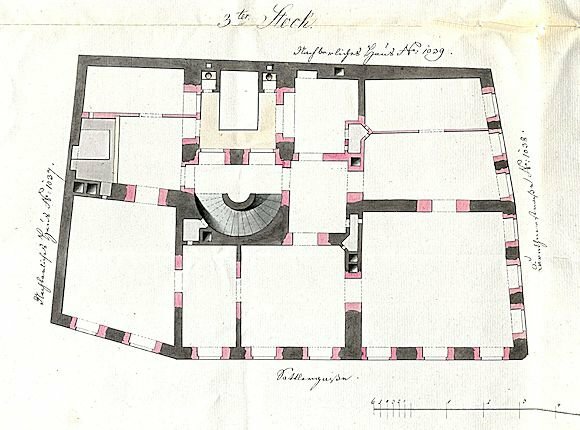 The groundplan of the fourth floor of the "Wallerisches Haus" which was drawn in March 1826 on the occasion of the addition of a fifth floor (the red color marks the reenforcements of the walls). On the right is the Kärntnerstraße, at the bottom the Sattlergasse towards the city wall. This floor is described in the 1788 tax register as consisting of two apartments of which each consisted of "2 rooms, 2 chambers, 1 kitchen". On the top a small atrium is visible. On the ground floor the big room at the corner of the house was the seating room of an inn (A-Wsa, Unterkammeramt, A33, 11811/1826). 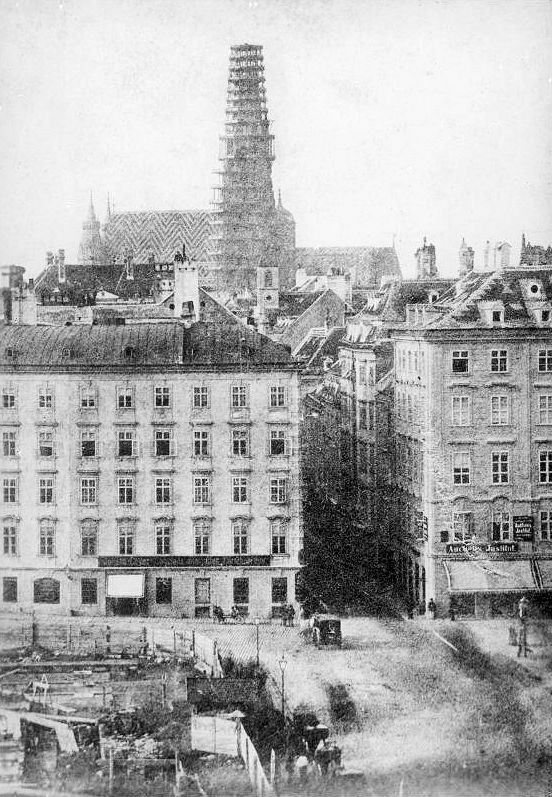 There is a well-known photograph dating from before 1858 that shows the two top floors of Vivaldi's last residence looking over the old city wall right beside the old Kärntnertor. I refrain from using this photograph which has been published many times in the literature. Instead I present an unknown photograph that has so far completely escaped the attention of Vivaldi scholars. It was taken in 1863 from the roof of the newly built Heinrichshof and, because the city wall and the Kärntnertor had already been torn down, shows the full facade of the house Stadt No. 1038, (the "Wallerisches Haus") where Vivaldi had died 122 years earlier. The fifth floor was added in 1826 and the roof is not the old tiled original. This may well be the last picture ever taken of this building. In the foreground we can see the early stages of the construction of the new K.K. Hof-Oper, in the back the rebuilding of the south tower of St. Stephen's is in progress. The house Stadt No. 1038 (on the left), where Vivaldi died in 1741. 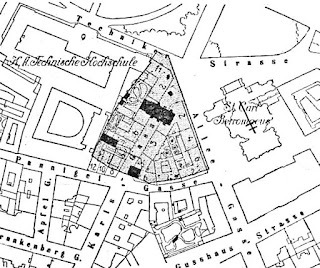 The two houses which today mark the beginning of the narrower part of Kärntnerstraße are not located on the exact same area as the buildings Stadt Nos. 1038 and 1019 that appear on this photograph (A-Wn, 114.145C). The information in the Vivaldi literature (Talbot 1993, p. 69) that this house was destroyed in 1858, together with the Kärntnertor, is false. 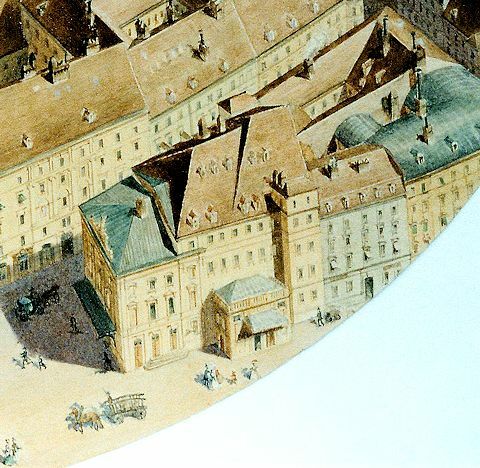 On Emil Hütter's elliptical watercolor of the Bürgerspitalszinshaus and its surroundings we can see the small atrium, the yellow facade and the round-shaped verdigris copper plated roof which had been added in 1826. A clip from Hütter's 1865 watercolor (Wienmuseum). The Kärntnertortheater is in the center, on the upper left there is a section of the Bürgerspitalszinshaus with the Komödiengassel and on the far right the green-roofed "Wallerisches Haus" is visible. Augustin Markus Waller, the saddler who had given the house both its names, died on 1 August 1730 of biliary fever (his funeral cost 37 gulden 32 kreuzer) and after having agreed to a settlement with her sons, his widow inherited the building. Seal and signature of Vivaldi's landlady Agatha Waller on her will, written on 14 August 1751 (A-Wsa, AZJ, A1, 10112/18. Jhdt.) Agatha Waller died on 11 December 1751. Based on information in the Viennese topographical literature some authors have pointed to the fact that Beethovens's lawyer Johann Zizius (1772-1824) and the legendary dancer Fanny Elßler lived in the Haus Stadt No. 1038. But from a musical point of view the far more prominent residents of this particular building were the composer Conradin Kreutzer (who lived there in 1830 with his family and his sister-in-law), the dancer and theater director Louis Duport and – in my opinion more interesting – Therese von Droßdik (née Malfatti), Beethoven's never-to-be bride, who died in this house on 27 April 1851. 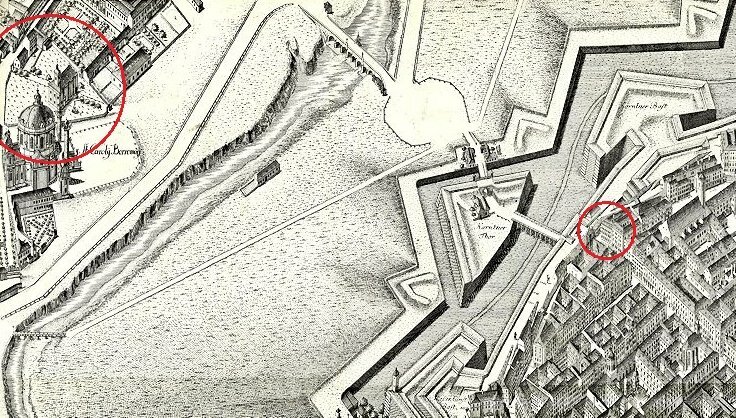 After the exequies in the cathedral Vivaldi's body was transported all the way down the Kärntnerstraße to the Kärntnertor again, then across the 85 meters long bridge which spanned the city moat and the Kärntnertorbrücke across the Wien to the cemetery of the Bürgerspital. 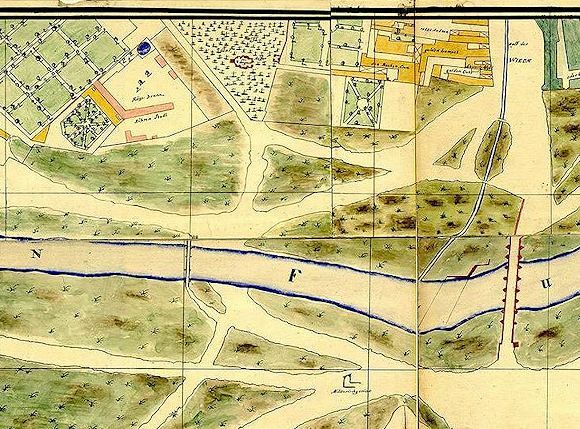 The "Wallerisches Haus" beside the Kärntnertor on the right and the "Spitaller Gottesacker" beside the Karlskirche on the left on Joseph Daniel von Huber's 1778 map of Vienna. The cemetery of the Bürgerspital with the St. Augustine Chapel (built in 1701). This is not a contemporary drawing, but a nineteenth-century watercolor copy of the cemetery as it appears on Huber's map. The cemetery and the chapel were closed on 1 May 1783. In 1785, after the chapel had been torn down, the houses of the priest and the gravedigger were sold to the military and used as uniform depositories. 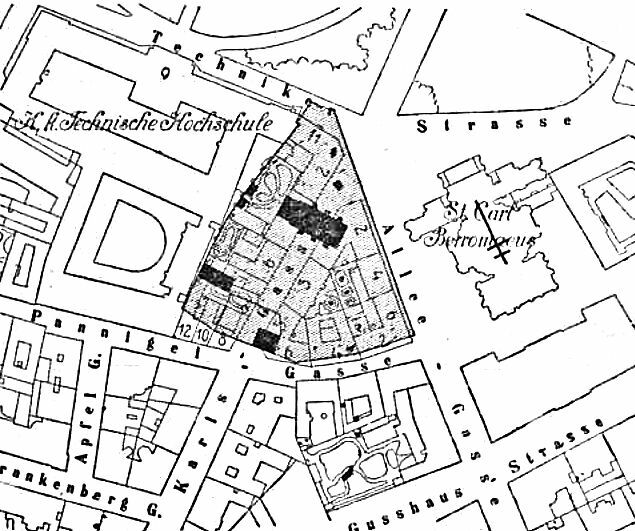 Because these premises did not meet the demands, they were sold back to the Bürgerspital in 1788. In 1791 the ground was leased to the military command which established a riding area there until in 1807 the area was put up for auction and a number of houses were built there. The memorial plaque for Vivaldi on the east wing of the Vienna University of Technology is slightly misplaced: the Bürgerspital cemetery was located closer to the Karlskirche, on the adjacent area between Argentinierstraße and Karlsgasse. 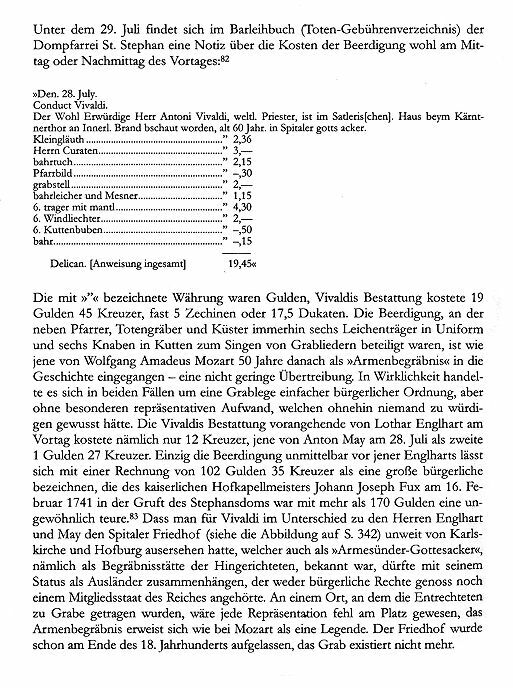 Somehow the problems with the publication of the pivotal primary source already began in 1938 with Rodolfo Gallo, who, having never actually seen the original document at the Cathedral's archive in Vienna, published the entry with a wrong name of the book ("Totenbuch"), one transcription error ("Grabstall" instead of Grabstell), an incomplete folio number (only "Fol. 177") and without the word "Pelican" at the end. Furthermore, Gallo failed to include any information regarding the general context of this document, as well as the currency of the expenses – mistakenly calling them "spese modeste" and noting their sum only as "19:45". He did not provide a usable translation of this entry and because of the words "im Satleri[schen] Haus" he erroneously assumed that Vivaldi had died "nella casa della famiglia Satler". Antonicek/Hilscher: Vivaldi (Graz: Akademische Druck und Verlagsanstalt 1997, p. 137): The date is wrong and the expenses do not add up to 19 gulden 45 kreuzer. A section of p. 252 of Rampe's book Antonio Vivaldi und seine Zeit. The date at the top "29. Juli" (copied from Antonicek) is wrong. The comma after "19" is wrong and the quotation mark does not mean gulden, it means kreuzer. Five sequins were not 19,7 ducats. 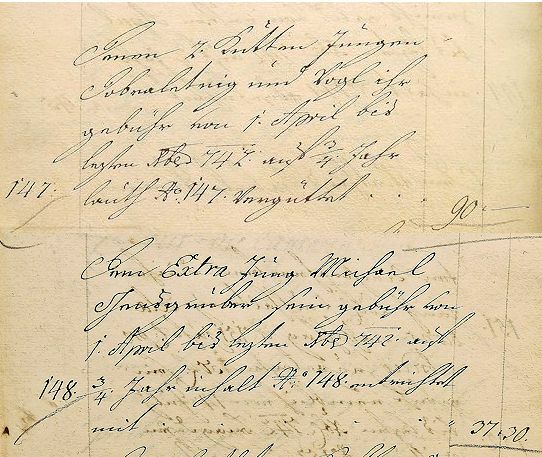 Johann Joseph Fux's burial, which did not take place on 16, but on 15 February 1741, did not cost 170 gulden, but 180 gulden 52 kreuzer (Rampe knows nothing about Fux's burial, except what he extrapolated from Heller's book). The "Spitaler Friedhof" was not located "unweit der Hofburg", the "Kuttenbuben" were not boys and they did not sing "Grablieder" (burial songs). The fact that Vivaldi was buried in the "Armesünder-Gottesacker" had nothing to do with his status as foreigner. Note that Rampe calls the two dead children "die Herren Englhart und May". Together with the typo "Beerdingungen" this jumble is vintage Laaber material. Von Feichtenberg received a "Fürstengleuth" for 4 gulden 20 kreuzer, twelve Kuttenbuben folded their hands at her bier and she had musicians (for six gulden) performing in the church and singing "[Der] grimige todt" which at the Cathedral at that time was the "ordinari" (standard) funeral song whose a capella performance always cost six gulden. That there were exactly six musicians was Pincherle's assumption. As can be seen, the item that made Feichtenberg's burial so expensive was not the "Gleuth", but the tomb in the crypt of the Cathedral which cost 50 gulden. In his book Vivaldi: Voice of the Baroque (London: Thames & Hudson, 1993) Robbins Landon expresses a similar judgement: "He was entitled, only to the Kleingeläut, or the pauper's peal of bells, costing two florins and thirty-six kreuzer." In his Vivaldi article in The New Grove Dictionary of Music and Musicians Talbot states: "[...] he was given a pauper's burial on the latter day at the Hospital Burial Ground (Spittaler Gottesacker)." (New Grove, Vol. 26, p. 820). In the other prominent music encyclopedia Musik in Geschichte und Gegenwart Karl Keller tells us that Vivaldi was buried "mit einfachster Zeremonie" (with the simplest ceremony) (MGG, Vol. 17, col. 89). None of the authors who wrote books about Vivaldi ever scrutinized the Viennese sources to actually figure out how obsequies at the time of Vivaldi's death were performed in Vienna. These four classes of "Gleuth" actually referred to four different bells on the cathedral. On rare occasions at a price of 50 gulden the "große Glocke" (the old Pummerin) was pealed, but this was not a separate class, it was an additional luxury which was only available for members of the Landstände (i.e. the nobility). Of course combinations were also possible: after a "Großgleuth" at the beginning of the ceremony there could be an additional "Fürstengleuth" right before the Requiem prayer ("zum Requiem vorgeleuth"). There were bells of many other churches that could be pealed on demand on the occasion of funerals at St. Stephen's: the Magdalene Chapel beside the Cathedral, St. Peter's Church, the Minoritenkirche, the Bürgerspitalskirche, the Ruprechtskirche, "Unser Lieben Frauen Stiegen", St. Nicola, St. Salvator and the "Deutsches Hauß". Furthermore there were bells of chapels in privately owned houses all over the city that could be pealed for funerals, such as the ones in the Freisingerhof, the Gundelhof, the Seitzerhof and the Johanneshof. Many funerals, like those of small children and really poor people, had no peal of bells at all. There were a number of general rules and customs concerning funerals at the Cathedral that can be figured out by studying the eighteenth-century Bahrleihbücher of St. Stephen's. The "Kleingleuth" was not part of a pauper's burial. Real pauper's burials were "gratis". The "gratis" burial of Giulio Cesare Birravri on 30 May 1741 in the cemetery of St. Stephen's (A-Wd, BLB 1741, fol. 131r). This entry proves that poor adult foreigners were also buried in the "St. Ste[phans] Freind Hof", i.e. the cemetery around the Cathedral. The "Kleingleuth" was the standard procedure for the funeral ceremony of adult citizens. Court officials, civil servants, civil craftsmen and secular priests all received this kind of peal of bells. Karl Heller's claim that "the sum of nineteen florins and forty-five kreutzers would have been sufficient for only the simplest of ceremonies" (Heller 1997, p. 265) is simply false. The entry concerning the funeral of the "Königlicher Laufer" (Royal footman) Lucrezio Bonno on 8 April 1742 which proceeded exactly like Vivaldi's (A-Wd, BLB 1742, fol. 95r). Bonno (b. 1683 in Pralboino) was the father of the Hofkapellmeister Joseph Bonno (1711-1788). Bonno's first name was not Giuseppe (as given on Wikipedia and in the recent Mozart literature), but expressedly Joseph, because his godfather was Emperor Joseph I. Contrary to the date given in the literature Joseph Bonno was born on 30 January 1711 (A-Wd, Tom. 54, fol. 397r). The entry concerning the funeral of the secular priest Joseph Russignol on 1 February 1741 in the "Schwarz Spanier" cemetery on the Alsergrund (A-Wd, BLB 1741, fol. 24r). Except for the Kelch (chalice), which was put on the bier, this funeral resembled Vivaldi's. The entry concerning the funeral of the renowned composer Carlo Agostino Badia on 24 September 1738 (A-Wd, BLB 1738, fol. 254r). 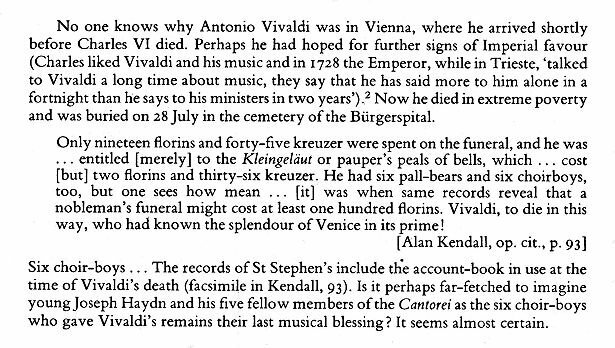 Note that, owing to the lack of lanterns, the funeral of the "Kaÿs: Hof- und Cammer-Musicus" was two gulden cheaper than Vivaldi's, suggesting that the lanterns at Vivaldi's funeral were a dispensible luxury. Badia died a wealthy man and his funeral only was so modest, because he had requested this in his will. The entry concerning the funeral of the court musician (bass singer) Marco Antonio Berti on 9 December 1741 (A-Wd, BLB 1741, fol. 269v). 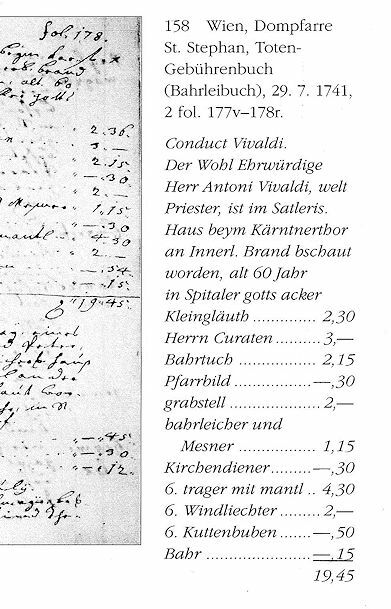 Because Berti was buried in the cemetery around the Cathedral, his expenses included the ringing of the cemetery bell and the fee for the gravedigger which added 66 kreuzer to the costs of Vivaldi's ceremony. The class of peal of bells was not the decisive factor concerning the costs of funeral ceremonies at the cathedral. The most expensive items – apart from the very high costs of tombs in the cathedral's crypt which sometimes came with the additional wage of a master builder – were always the services of qualified people, such as the presence of a high number of additional clergymen (Curaten and Canonici). One Canonicus cost three gulden, a curate two, an accolidus (acolyte) 50 kreuzer. 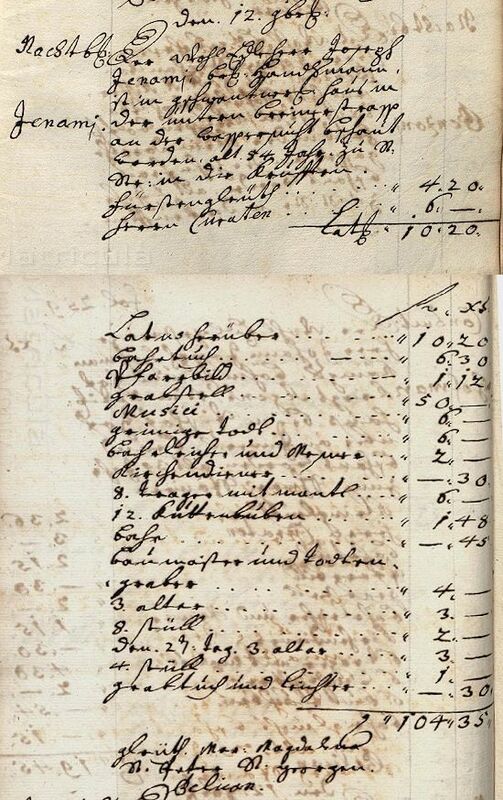 The Kuttenbuben only cost nine kreuzer apiece, the better Minestranten each cost one gulden. High fees had to be paid for musicians (in variable numbers) who actually sang a Miserere and one or several "Motteten" (an exception being the obsequies of prominent musicians such as Antonio Caldara for whom on 29 December 1736 his colleagues performed "gratis"). Even more expensive was the participation of instrumentalists (for 15 gulden) who accompanied the singing "mit Sartin" (also spelled "mit Sardin") or "Sartindl" (with muted trumpets or trombones). The most expensive musical service available was the performance of an actual Requiem which required additional musicians for at least 15, or up to 24 gulden. Sometimes the conduct was followed by a group of poor people from various poorhouses, such as the "Nepomuceni Spitall" on the Landstraße or the poorhouse in the Alstergasse, who received alms from the attendants and the clergy. This was an important additional income for the poor and this custom was observed in Vienna into the nineteenth century (on its way from the Alsergrund to Währing Beethoven's coffin was followed by inmates of the "Versorgungshaus am Alserbach" who got paid for this service). Sometimes the bier was also accompanied by regular people, who are listed as Steuerdiener (tax payers) in the Bahrleihbuch. 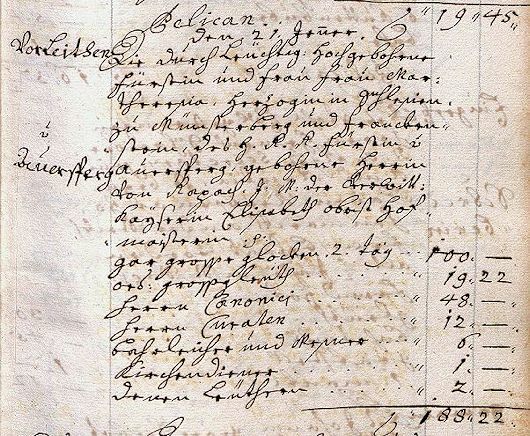 A group of poor people, following the bier of Georg Gaber, a law student, who was buried on 23 December 1741 on the "Spitaller Gottsacker": "Mitgang. 12. paar arme Leüth auß Nep:[omuceni] Spitall 12. paar auß d[er] alstergass[en] [Gleuth] Paulaner und Francis:[caner]. Pelican" (A-Wd, BLB 1741, fol. 280r). The entry concerning the exequies of the architect Joseph Emanuel Johann Fischer von Erlach in the evening of 29 June 1742 (A-Wd, BLB 1742, fol. 173v and 174r). Prominent people often received a Nachtbegräbnüß (night funeral). Note the five altars which were put up on the following day and the additional "gleuth" at "[St.] Magdalena, Bürger Spitall" and the "Johannes Hof". The entry concerning the funeral on 10 January 1726 of Carlo Agostino Badia's first wife, the singer Anna Maria Badia, née Lisi (A-Wd, BLB 1726, fol. 7r), whom Badia had married on 18 October 1700 (A-Wd, Tom. 34, pag. 710). Again, the grave in the crypt was the most expensive item. The last item are "12 stiell" (12 chairs). Note that the song "[Der] grimmige Todt" could also be accompanied by muted trumpets or trombones ("mit Sartindln"). When Johann Steinecker tried to transcribe this entry for his 1993 dissertation Die Opern und Serenate von Carlo Agostino Badia (supervised by Theophil Antonicek), he could not figure out the meaning of the note "grimmiger Todt mit Sartindln" and transcribed it as "gereinigte Tote mit Sartinol", as if "Sartinol" was some kind of disinfectant for corpses. This is one of the all-time funniest transcription mishaps in Viennese historical musicology. The obsequies for Princess Maria Theresia von Auersperg, née von Rappach on 21 January 1741, with "VorLeithen" (a preceding peal), two peals of the Pummerin ("gar grosse glocken") on two separate days and a double ("ordinari") "grossgleüth". This was not a a funeral, but only the consecration of the Princess whose body, on 23 January 1741, was transferred to Garsten where it was buried in the crypt of the monastery (A-Wd, BLB 1741, fol. 16r). 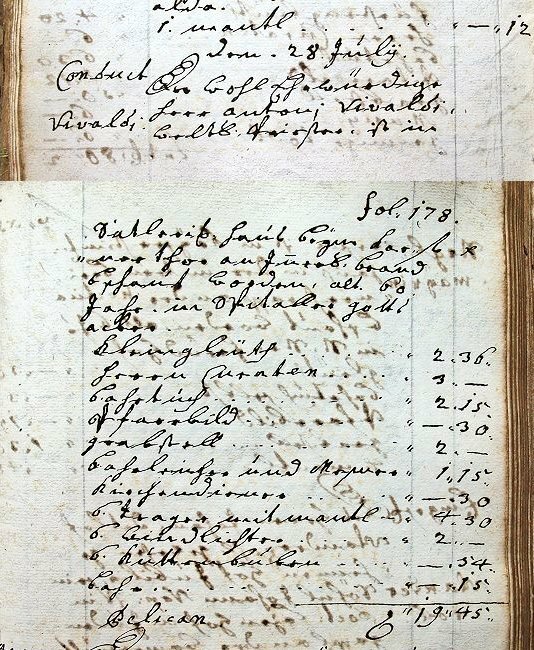 The entry concerning the exequies of the merchant Joseph Jenamy on 12 November 1740 (A-Wd, BLB 1740, fol. 259). 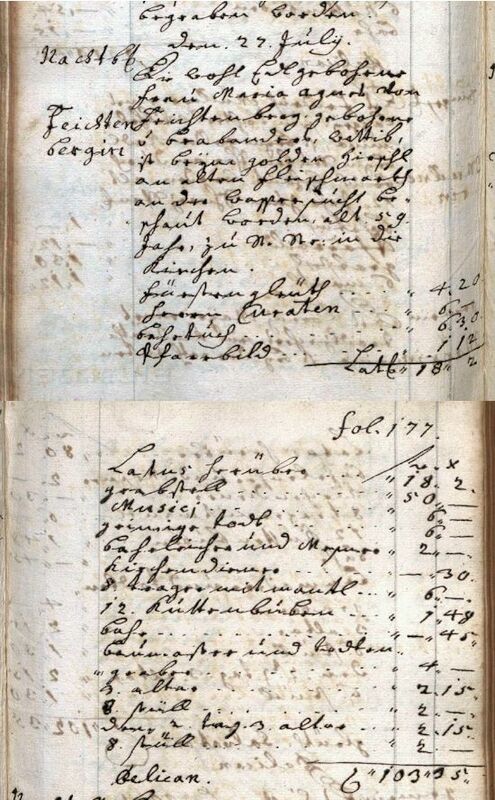 The list of expenses includes a "Fürstengleuth" and the already known expensive grave in the crypt. Here we see that the song "Der grimmige Todt" was also performed without brass and (in addition to the Miserere for six gulden) had to be paid extra. The external bells included St. Magdalene's, St. Peter's Church and St. George's Chapel in the Freisingerhof. Joseph Jenamy (b. 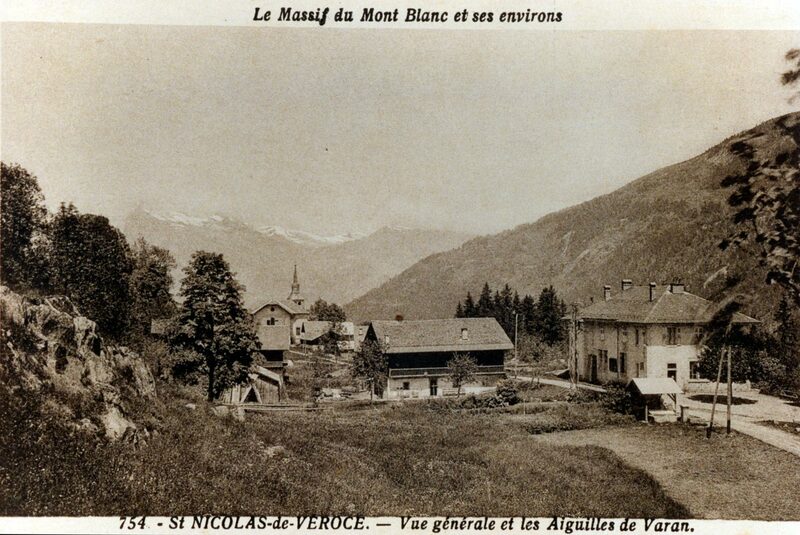 1686 in Saint Nicolas de Véroce) was a great-uncle of Nikolaus Joseph Jenamy (1747-1819), who in 1768 married Louise Victoire Noverre (1749-1812), the dedicatee of Mozart's piano concerto K. 271. The most expensive funeral in the Bahrleihbuch of 1741 is that of Johann Caspar Joseph Kolb von Kollenburg, "Weÿl[and] der K.K. M[ajestät] Unter Stabelmaister" (deputy staff holder of His late I. & R. Majesty Charles VI), which cost 195 gulden and 16 kreuzer (A-Wd, BLB 1741, fol. 10v and 11r). 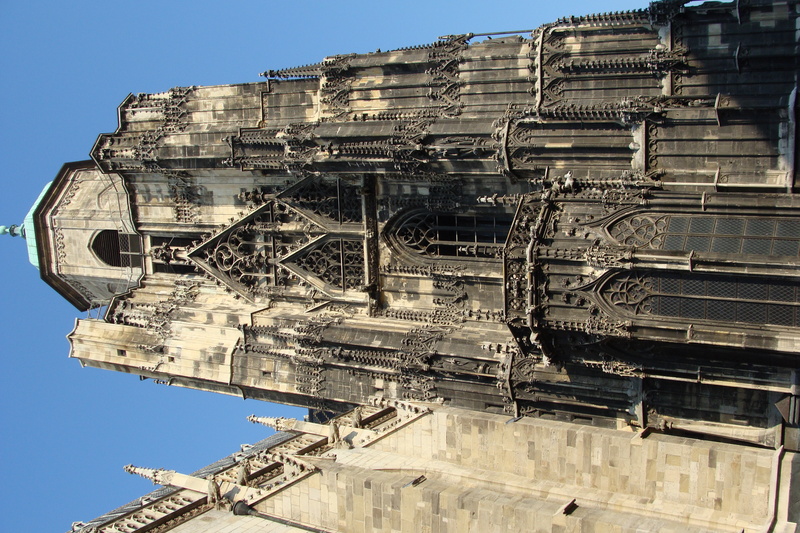 It included a Großgleuth, a tomb in the crypt, a Requiem with Fürstengleuth, 30 Kuttenbuben and five altars. The mysterious "Pelican" that appears at the end of the expenses for Vivaldi's funeral and which in the Vivaldi literature has previously either been ignored, or left uncommented, was a picture of a pelican as a Christian symbol that was put on the bier. Because in the Middle Ages it was assumed that the pelican provides its own blood to its young by wounding its own breast, when no other food is available, this bird became a symbol of the Passion of Christ and the Eucharist. There were several pictures that could be put on the bier at St. Stephen's: pictures of St. Sebastian, St. John of Nepomuk, the Good Sheperd, Todtangst (Agony of Christ), the Holy Rosary, the Holy Trinity, one of a Bruderschaft (confraternity), a Dominicaner, a Carmeliter and two (unspecified) "Franciscaner Bilter". But the pelican was by far the most frequently used. Sometimes a devotional scapular was also put on the bier. The custom of displaying these pictures may go back far into the seventeenth century, but it is documented in a Bahrleihbuch for the first time only in 1682. 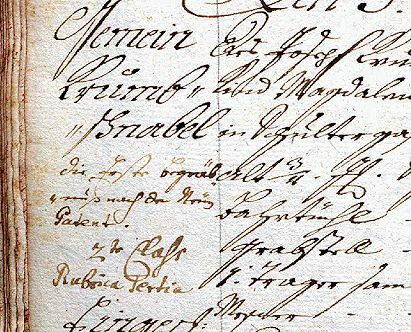 The final passage of the entry in the Bahrleihbuch concerning the funeral of Catharina Regina Thenig on 30 December 1682: "Seint mitgangen Kaÿ:[serliche] Spitall:[er] und Franscis: Gleüth beÿ St: Maria Magd: Bildter: Todtangst und Francisc." ("on the bier the pictures of the Agony of Christ and the Franciscans") (A-Wd, BLB 1682, fol. 171v). 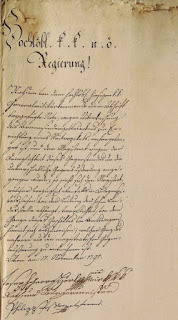 The final passage of the entry concerning the funeral of the mason Adam Häringsleben on 12 Januar 1683: "Haben tragen 8 Steür diener seint mitgang Kaÿ:[serliche] Spitäller Francisc: Dominic: und Minorit[en] Gleüth S:[ancta] Maria M[a]gd: S. Georgj S: Petri auf d[er] Pahr Pelican und St. Sebastiani Bildt." ("on the bier the pictures of the pelican and St. Sebastian") (A-Wd, BLB 1683, fol. 3v). 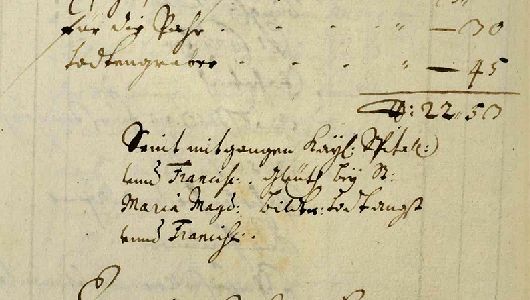 The final note of the entry concerning the funeral of Mathias Napert on 5 May 1740: "Mitgang 12. paar arme Leüth auß Nep[omuceni] Spitall 12. paar auß d[er] Alstergass[en] Franciscaner, Domin:[icaner] gleüth. Magdalena, Bilder Pelican, Rosen Cr:[antz] guten Hürten." ("pictures: pelican, rosary and Good Sheperd") (A-Wd, BLB 1740, fol. 118v). The four categories of "Gleuth" existed until March 1751, when an Imperial edict replaced them with four "Classen". The prices of the peals in these classes were reduced to (from 1st to 4th class) seven, four, three and one gulden. These classes could be subdivided into rubrics – mostly for the burials of children – but to delve deeper into the intricacies of this new system would lead too far. The first funeral ceremony at the Cathedral which was accounted according to the new regulation, took place on 3 March 1751. It has been suggested in the literature that Vivaldi may already have died on 26 or 27 July. 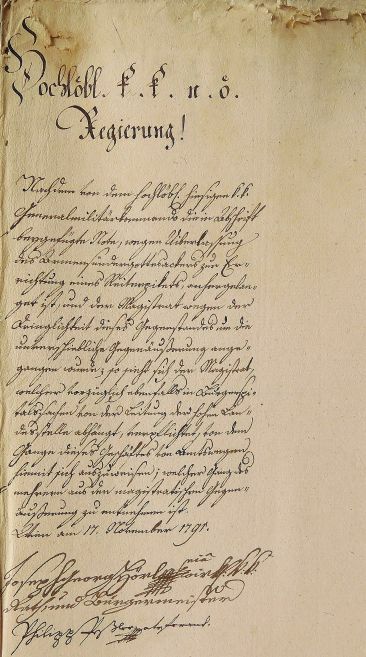 But after closely comparing the official death records of the Vienna Magistracy (the Totenbeschauprotokoll) with the 1741 Bahrleihbuch of St. Stephen's, I have come to the conclusion that during the summer people in Vienna were always buried the very same day they died. Especially interesting – although not particularly surprising – is the fact that there are a number of deaths recorded in the Bahrleihbuch that are missing in the Totenbeschauprotokoll. The fact that Vivaldi was buried in a cemetery which was traditionally called "Armesünder-Gottesacker" (i.e. cemetery of the executed) has sometimes been explained with the composer's status as poor foreigner who had no civil rights, because he was not a citizen of the Austrian monarchy. This hypothesis is not tenable. It was a complete coincidence that Vivaldi was buried on the Wieden, because the records show that in the eighteenth century the dead were buried in whatever cemetery at the moment could provide space. Apart from the Cathedral's crypt (where the graves were expensive) the following burial sites were used for people who were consecrated at St. Stephen's at that time – regardless of their age, wealth or nationality: the cemetery of St. Stephen's (surrounding the Cathedral), the "Spitaller Gottesacker" on the Wieden, the cemetery of St. Nikolai ("auf die Landstraß"), the crypt of the convent church of the Trinitarian Order and the "Montserrater Gottesacker"on the Alsergrund ("zu den Schwarzspaniern"), the crypts of St. Michael's Church, the Minorites Church and the Augustinian Church and the monastery church of St. Nikola in the Singerstraße. The fact that Vivaldi was buried in an own grave at a relatively high cost of two gulden makes the fact that his funeral has repeatedly been described as that "of a pauper" even more bizarre. From the countless books about Haydn that present Robbins Landon's idea as proven fact I want to point out Hans-Josef Irmen's Joseph Haydn Leben und Werk (Vienna: Böhlau, 2007) where the information that Haydn sang at Vivaldi's funeral is even attributed to Pohl ("and others"[sic]): "Pohl u.a. berichten, daß der junge Haydn bei den Exequien für Vivaldi mitgewirkt habe." (Irmen, p. 335). Of course, Carl Ferdinand Pohl (1819-1887) reports no such thing in his biography of Haydn. He did not even know that Vivaldi had died in Vienna. It is amazing how the probability of this romantic scenario is suddenly destroyed by having seen all the above entries from the eighteenth-century Bahrleihbücher. From 1715 on the Cantorei of St. Stephen's employed six Capellknaben (choirboys). The documents presented above show that it was a mere coincidence that exactly six Kuttenbuben attended Vivaldi's funeral. And yet this exact number – the number of Capellknaben at the Cantorei – played a major role in the misunderstanding that lead to the metamorphosis of these Kuttenbuben into choirboys. Haydn was accepted into the Cantorei of St. Stephen's Cathedral in 1740. Since Kapellmeister Reutter was in a position to only pick the most talented choirboys, Haydn's recruitment was a big privilege and a stroke of luck for the country boy. Haydn lived together with the other choirboys in the building of the Cantorei which was administered by the Kirchenmeisteramt (i.e. the City of Vienna). The administration of the Cathedral and its music was traditionally subordinate to the Vienna Magistrate, which is the reason that Mozart, when in 1791 he applied for an adjunct postion at the cathedral, submitted his application to the municipal authorities. 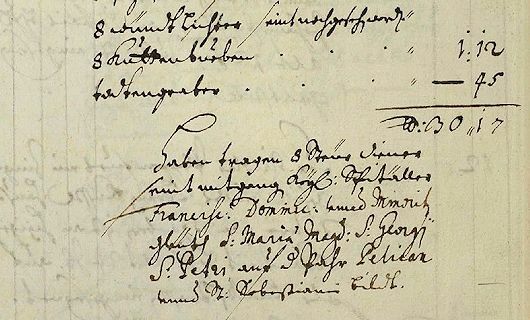 The so-called Kirchenmeisteramtsrechungen (ledgers of the church administrator of the Vienna Magistrate) provide detailed information about the organisation of the Cathedral and its employees. They show that the records of expenses for the regular staff ("Außgaab auf ordinarÿ Besoldung", i.e. expenses for ordinary salaries) were strictly separated from the expenses for the musicians of the Cantorei. 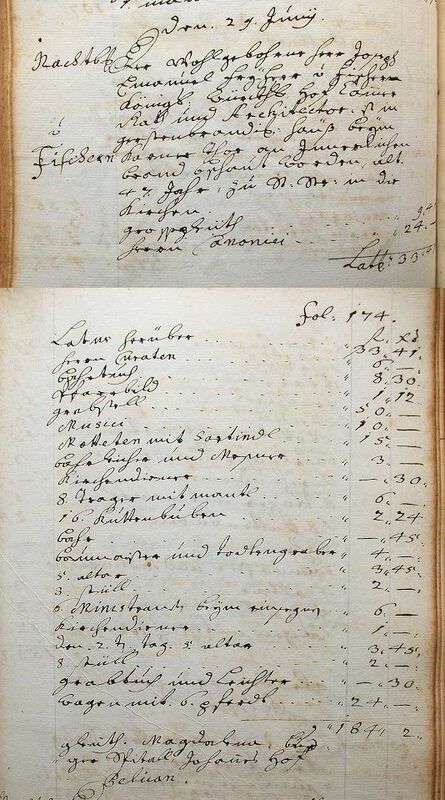 The beginning of the list of expenses ("Außgaab. Auf die Cantoreÿ beÿ St. Stephann") for nine months for the Cantorei of St. Stephen's in the 1742 Kirchenmeisteramtsrechnung (A-Wsa, Handschriften, A 41.24, fol. 79r). In 1741 the Kirchenmeister (church administrator) was Claudius Jenamy (1702-1776), a nephew of the abovementioned merchant Joseph Jenamy. Today the eighteenth-century Kirchenmeisteramtsrechnungen are held by three different archives: the Vienna City Archive, the Vienna Diözesanarchiv and the Domarchiv. The organist at that time was Anton Neckh who in 1736 had succeeded Reutter's son Karl on this post. 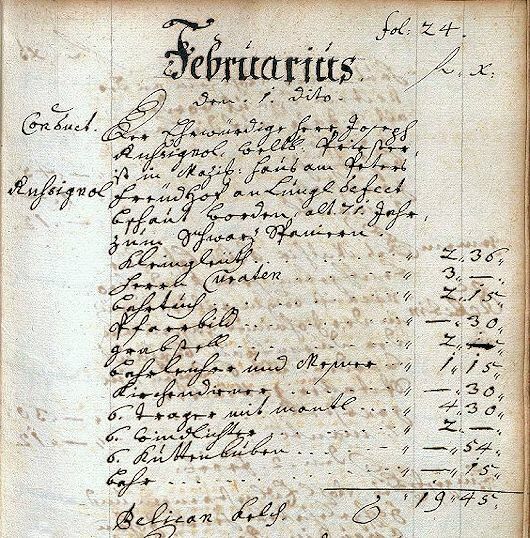 Georg von Reutter's annual salary consisted of 300 gulden Gebühr (salary), plus 24 gulden Kleÿdergeld (clothing allowance). For the boarding of the six Capellknaben (among them Joseph Haydn) Reutter received an additional sum of 1,200 gulden plus 75 gulden Instructionsgeld (teaching fee). Each of the nine Vocalisten received an annual salary of 130 gulden plus an annual Choraladjutum (choral subsidy) of 26 gulden 60 kreuzer per capita. In addition to that they were also paid one gulden "Rorate Geld" plus (at least in 1742) one gulden forty kreuzer for substituting for dismissed choirboys. 148:/ Dem Extra Jung Michael Geusgruber sein gebühr von 1. April bis lezten Xbr 742. auf 3/4. Jahr inhalt N:° 148. entrichtet mit . . . . . . . . 37 " 30. 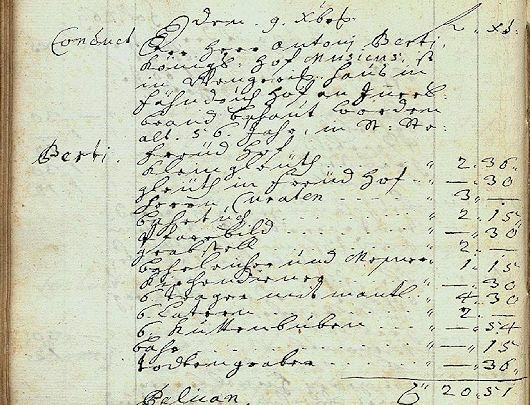 The overall expenses of the Kirchenmeisteramt in 1742 amounted to 20,255 gulden and half a kreuzer. The surplus in that year was 2,722 gulden and 29 kreuzer. Vivaldi's funeral ceremony on 28 July 1741 at St. Stephen's corresponded to that of ordinary Viennese citizens. Because the performance of music was not ordered and paid, no music was performed at that ceremony. To have musicians sing at a funeral at St. Stephen's in 1741 one had to pay at least six gulden for the performance of the song "Der grimmig Tod". A perfomance of a motet was even more expensive, especially if it was accompanied "mit Sardin" ("with mute", i.e. with muted trumpets or trombones). The Kuttenbuben who were present at Vivaldi's exequies did not sing. They just stood at the altar and folded their hands in silence. They were not choirboys of the Cantorei, but members of the ordinary staff of the Cathedral. There was a strict organizational separation between the ordinary employees and the musicians of the Cathedral. Joseph Haydn had nothing to do with Vivaldi's funeral. The mistaken assumption that choirboys were present at this ceremony originated with Marc Pincherle, who in 1948 translated the entry "6 Kuttenbuben" in the original source with "six enfants de chœur". After Alan Kendall in 1978 had turned these "enfants de chœur" into "choirboys", Robbins Landon could not resist the appeal of this scenario and presented Haydn's singing at Vivaldi's exequies as a fact. It is a myth. 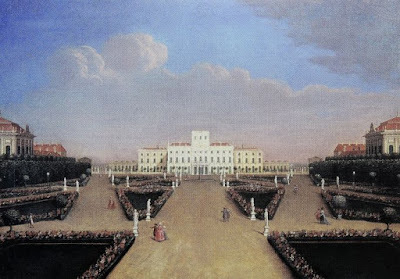 Despite repeated statements in the literature that the chances are slim of finding unknown sources concerning Vivaldi's final stay in Vienna, research on this topic is far from finished. It has only just begun.